Of all the many models I have created in the past, the ones that gave me the most satisfaction were the ones that had not just one but at least two different moving actions and for a while I had thought about creating a new fairground model ride to add to the club of previous models such as the Spider Rider or the Star Gazer, to name just a few. It's not that I seek to diminish my other models at all, just that you turn in every direction to think of something new, and it is the challenge of each creation that really drives you. 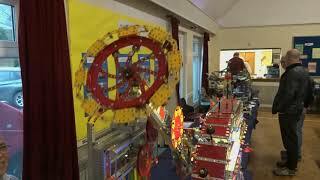 Many fairground rides have the basic principle of a circular rotating unit such as seen in the well-known 'Mary Rose', 'The Enterprise' or even the most famous of fairground attractions such as 'The Ferris Wheel', and on which rotating action I too have based many of my models. In fact, being spun around in never ending loops has become almost the staple diet of the amusement park attraction in recent years and so there is always the push to create something new, and turn the attention of thrill seekers your way. So, my next model idea was to improvise on the basic rotating arm action of these models and add something new. The aim was that as the whole of the rotating arm turned 360°, and that the passengers in the pod that was fixed at one end of the arm would not only be spun around in a loop but that their passenger pod would also start to turn with it. I started with the rotating arm of the ride in similar fashion to how I had started many other models by building a similar rotating unit but with the idea that the rotating arm structure should be much simpler and lighter than I had in the past. Once complete, the end of the arm was weighted for the required balancing. Then at one end of the arm a new passenger pod was designed and added with two identical rows of seats for the riders, placed one immediately behind the other. The important thing was to make the seating part of the unit able to rotate one way or another without any form of mechanical attachments, and it was the weighting on one side of the circular structure that made the desired effect come to reality. I was instantly pleased with the new concept and felt that the design immediately offered the potential thrill experience that all fairground models are judged on. I have seen some extreme rides with some similar rotating movements and so I wanted my design to be original and offer something slightly different and I feel like this was achieved. As with all designs plans, things aren't always completely straightforward, and by the end of the process much of the model gets built and un-built several times to achieve what you hoped you might first do with just a few tweaks and minor adjustments of the first attempt. As if there is really any such thing as getting it right from the start! There were a few headaches on the way but in short, the long heavy arm once fixed into place on a heavy-duty axle, did not rotate as I wanted and I found that I did not have any gears or pinions to fit in the thicker axle. I had to undo all the holding parts supporting it and replace it with a different system reverting to using this time a normal Meccano thin axle and two double arm cranks to hold the heavy circular unit securely and yet to freely rotate as I wanted. Two channels were constructed, one on each reinforced tower to bear the rotating structure in a way that also allowed for easy removal and safer eventual transportation. Having tested the system and found it worked fine the next thing I set about doing was to connect the unit to a motor and some sort of pulley, of which I tested three options before finally setting on the one that I thought worked most satisfactorily. Construction started on the 29th of November 2018 and by Saturday the 3rd of November the new model was totally finished and now I only needed a name to attach to the identity of my new model and all the lights, and sometimes this part can torment me more than the both the design and building process, as I want to end up with something that really feels real. While I was stewing over a choice of names, I found myself adding a small companion piece to the model in the form of a complementing cafe unit with an open terrazzo, which was built later, somewhere punters could get refreshments while they watched other riders before them get turned and twisted as the world spins around, and wait for their inevitable turn to be tormented on the new fairground ride. Turn this way or that way, there's no getting away - it's your turn to meet the 'Tormentor'.